Steam condenser performance is impacted when tube and tubesheet sealing joint is leaking. 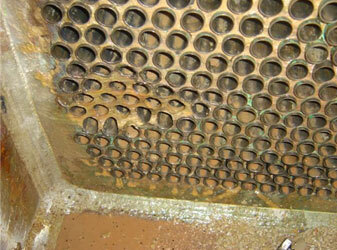 Curran repairs and restores condenser tubesheets using epoxy cladding; deterioration due to galvanic corrosion and velocity erosion can cause boiler and turbine performance issues. For more than a generation Curran has provided condenser restoration using 100% solids epoxy cladding systems. Curran coating systems have been used for all cooling water services, closed circulation, natural reservoir, and salt water condenser systems to protect steam condenser tubesheets, water boxes, marine boxes, channels and circulation piping. Our high functionality 100% solids epoxy coatings are available to industrial applicators worldwide. 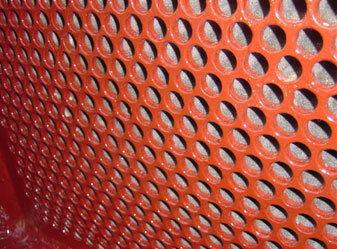 Waterboxes, channels, marine boxes, and circulation piping are primarily constructed of carbon steel or cast iron, and are subject to galvaniccorrosion, velocity erosion. Curran 100% solids epoxy coatings can be airless sprayed or brush and rolled, yielding a high gloss impenetrable finish to protect these essential components. Curran provides condenser re-tubing for turn-key restoration projects. Curran has global project experience, mobilizing field project teams for expert, in-situ coating applications. Our high functionality 100% solids epoxy coatings are available to industrial applicators worldwide. Curran 500 – Advanced two part 100% solids epoxy (0 VOCs) with versatile formulations to satisfy a range of application specifications. It is formulated in a brush or roller applied system, and as a paste grade repair version can be clad to 250 mils total DFT.